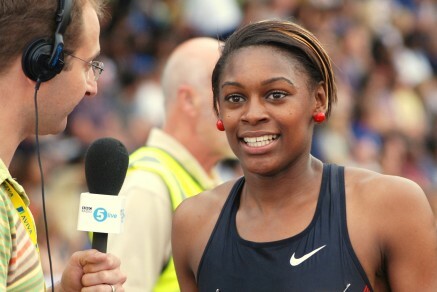 Perri Shakes-Drayton (GBR) stole the headlines in the AVIVA UK Trials in Birmingham with a double win in the 400m and 400mH. The Chris Zah coached athlete clocked 51.52 secs to win the 400m on Saturday and then came back to win her specialist event on Sunday in 55.52 secs. Mo Farah was an easy winner of the men’s 5000m in 14:00 while Michael Rimmer, who is still recovering from an injury, placed 2nd in the 800m in 1:47.64. Abi Oyepitan (GBR) took 2nd in the 200m behind Anyika Onuoru. On her comeback from a quad injury Olympic Champion Christine Ohuruogu (GBR) was 3rd in the 400m ahead of Nicola Sanders (GBR) in 5th. Andy Turner will go to Daegu in the 110mH but used this competition to test his 100m flat speed with a 10.39 secs clocking just missing out on a place in the final. Mark Lewis-Francis looked good in qualifying but false started in the 100m final meaning his place in Daegu will be decided after the London Grand Prix next weekend. Rhys Williams (GBR) finished 4th in the 400mH while some of the big names including Phillips Idowu, Chris Tomlinson, Chris Thompson and Jemma Simpson sat out this Championships but will compete in Crystal Palace on Friday and Saturday next week.